James & Sons Insurance is a local, family-owned insurance agency established in 1921. Specializing in auto, commercial, homeowners and life-health insurance, the company is staffed entirely by registered agents whose goal is to help find quality insurance for its customers while always offering friendly and personal service. 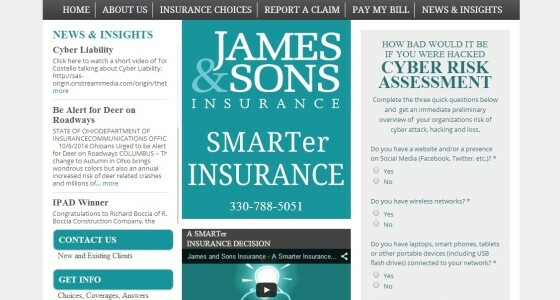 Farris Marketing created a new brand identity for James & Sons, “SMARTer INSURANCE,” and developed a new website, web videos and direct mail campaigns on their behalf. A special feature of the website is the Cyber Risk Assessment, which helps prospective customers evaluate the threat that hacking and other cyber crimes may pose to their businesses.